Christmas is coming, time to put on your scarves, hats, and mittens to go a-caroling! 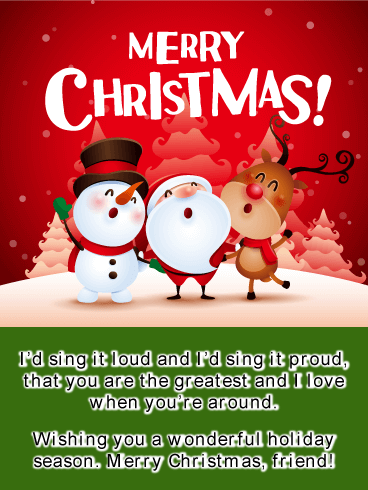 But first set the mood by sending your favorite singing friend this cute Caroling Buddies Merry Christmas Card! Santa, Rudolph, and Frosty have all joined forces (or voices!) 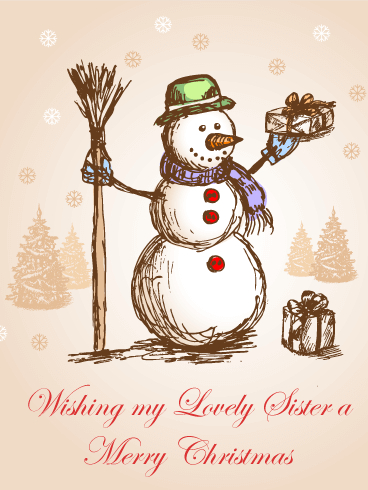 to bring a smile to your friend’s face with this card and its sweet little rhyming wish! Jump for joy! Christmas is coming! Time to sing and dance, eat too many cookies and exchange gifts with your favorite pals. If you’re looking to brighten your best friend’s day, try sending them this adorable jumping Holiday Characters Merry Christmas Card! It’s got Santa, a reindeer, a snowman and even an elf! 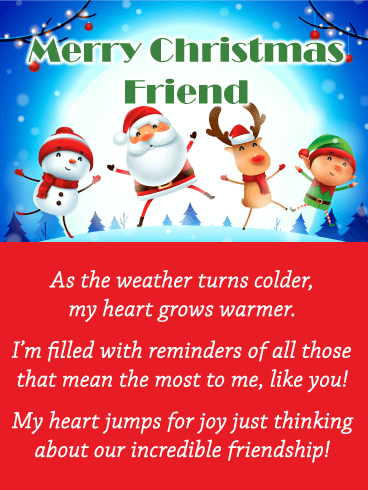 The weather outside may be frightful, but the fiery warmth of friendship is always delightful! 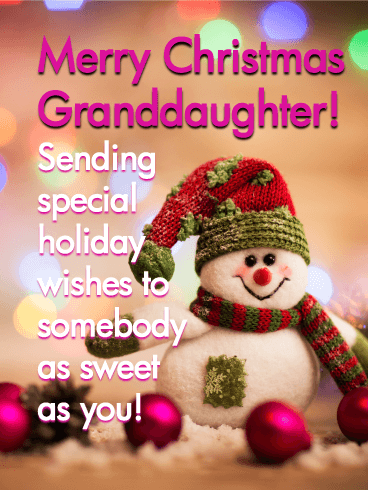 This adorable snowman will help wish your granddaughter a very merry Christmas! With a smile on his face, rosy cheeks, and bundled up in a hat and scarf, he’s got a cheerful spirit to make someone as sweet as her feel special during the holiday season. A colorful lighted background, pink ornaments and pinecones add to the charm of this card. A steaming cup of hot cocoa. The perfect post-snowman-building, warm-yourself-back-up treat! 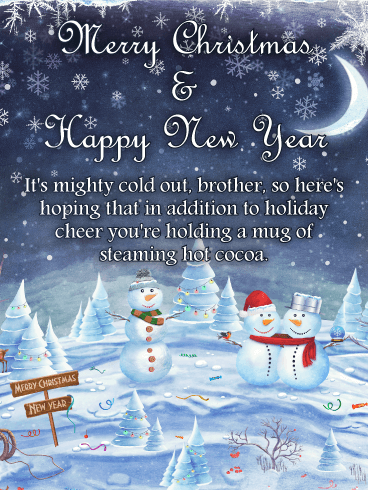 Send your wonderful grandson some cozy vibes with the snowman cocoa Merry Christmas Card! 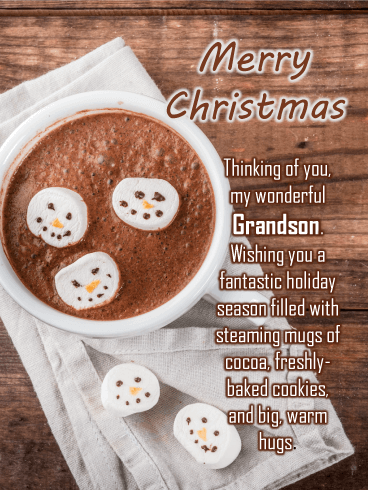 Marshmallows decorated to look like snowman faces float cheerfully in the mug alongside a heartfelt message wishing your grandson a fantastic season of love. Share a smile this holiday season with greeting cards for all your loved ones! Treat your special grandson to his own greeting card this holiday season. 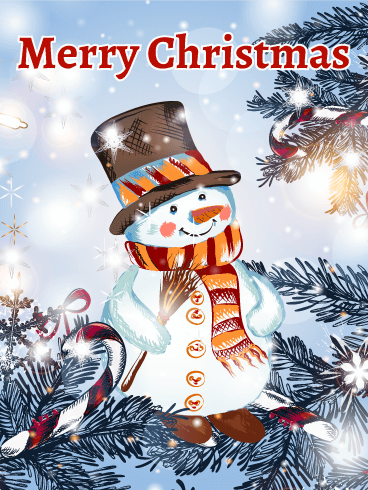 It has an adorable smiling snowman wearing a matching hat, mittens, and scarf looking up at the cheery Merry Christmas font; this card is almost too much fun! 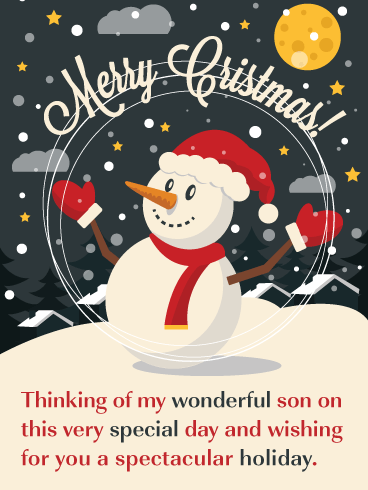 Sending this snowy card full of good wishes and love is sure to bring a sunny smile to your loving grandson’s face. 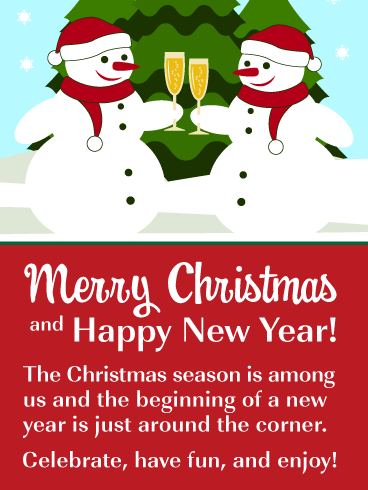 Two snowmen toasting to the holiday season makes for an adorable Merry Christmas and Happy New Year card! Here you will see two snowmen wearing Santa hats with a lovely Christmas tree set in the background. Snow is falling all around and it creates a traditional winter scene. 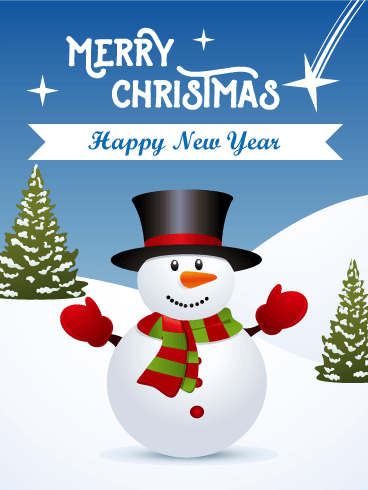 Send this charming Merry Christmas and Happy New Year card out to the people that you are thinking about today, they will certainly love it! 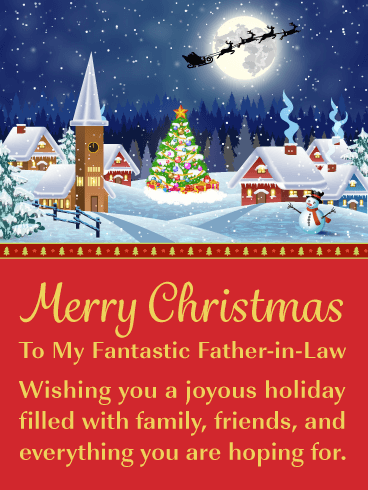 Wish your father-in-law a joyous holiday with this delightful Merry Christmas card! It displays a magnificent Christmas winter scene that captures the essence of the season. A stunning Christmas tree with a bright star takes center stage and looks fantastic. You can also spot a traditional snowman, as well as Santa and his reindeer flying through the air! Your father-in-law is going to love this Christmas card! Everyone loves snowmen, especially when they are as cute as this one! Your mother-in-law is going to love this Christmas card. It features great colors, perfect holiday gifts, Christmas ornaments, and of course, a snowman wearing an adorable Santa hat! 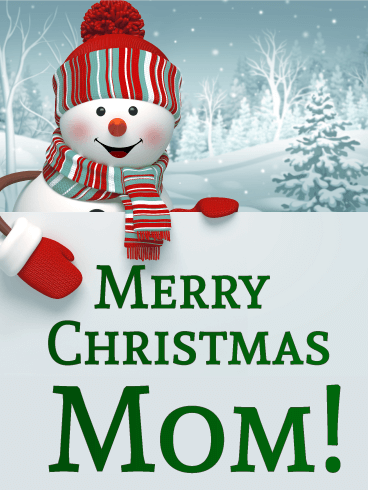 The message will let her know that you feel Christmas is even more special now that you are a part of the family. It will certainly warm her heart! 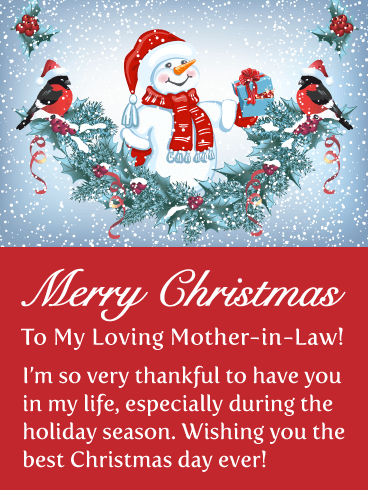 So send this fantastic Christmas card out to your mother-in-law today! 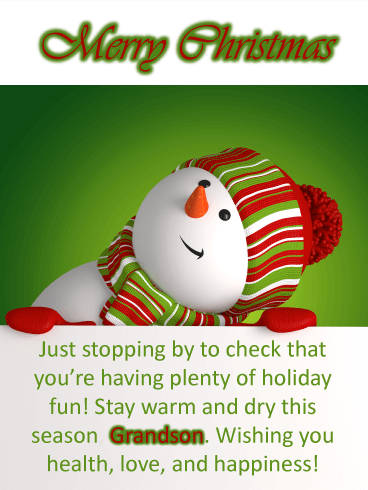 Snowmen are a wonderful representation of the holiday season and that’s why this Christmas card is so fantastic! It showcases the most adorable snowman wearing a top hat and scarf. Behind him sits two perfect Christmas trees covered in snow! The message will wish your mother-in-law a lovely day and that will certainly bring a smile to her face. Make sure to get this cute holiday card to her without delay so she can enjoy it on Christmas day. 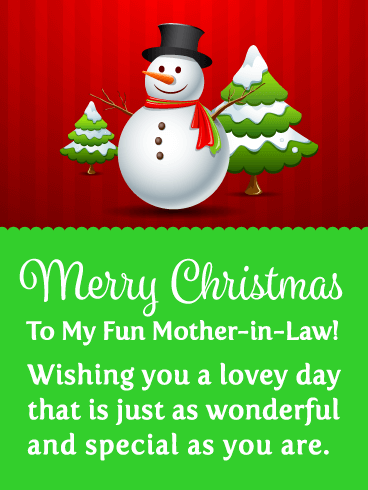 Let your mother-in-law know how much you care by sending this charming Merry Christmas card her way. It will let her know how thankful you are that she is in your life. This will certainly fill her heart with joy! A lovely snowman is wearing a Santa hat while he holds a Christmas gift. So cute! Two holiday birds sit beside him as they celebrate the season! 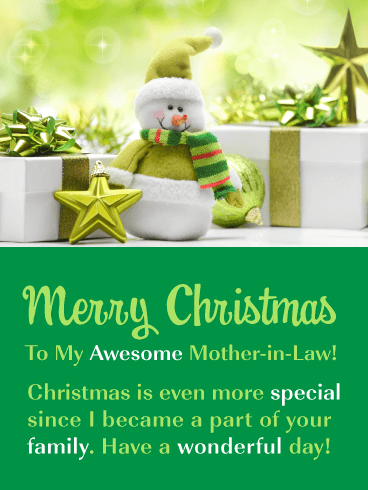 Wish your mother-in-law the best Christmas day ever with this fabulous holiday card! This cool snowman is ready to wish your son a Merry Christmas. He is decked out in his holiday attire, complete with a Santa hat, gloves, and scarf! This Christmas card would be perfect if you would like to wish your son a spectacular holiday and let him know how wonderful you think he is. Be sure to send this exceptional Christmas card to your son so he can enjoy it on this special day. WishyourcousinthebestChristmas ever with this cool holiday card that was created just for him or her! The snowman is wearing a Santa hat and scarf. So adorable! A blue sky with falling snow is the backdrop and makes for a perfect winter scene. 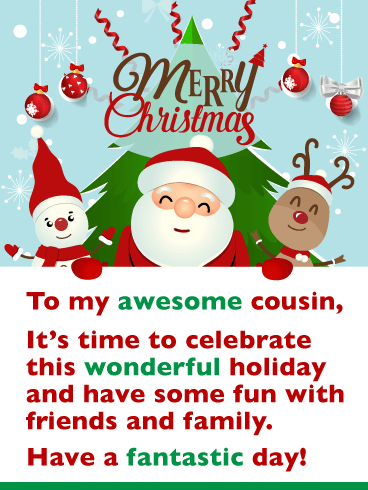 This Christmas card’s message is very thoughtful and will add joy to your cousin’s day. 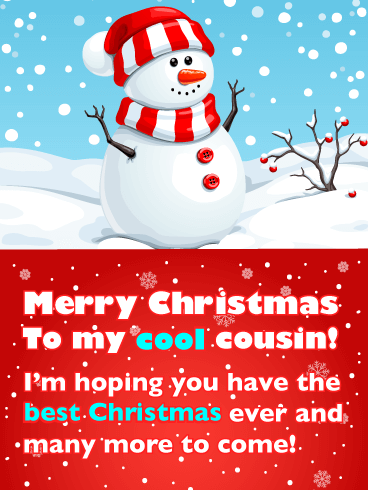 Send this Christmas card out today so this wonderful snowman can meet your cousin on Christmas day! Brighten your cousin’s day with this wonderfully fun and cute Christmas card! Your cousin will just adore it! It features special Christmas characters such as Santa Clause, a reindeer, and a holiday snowman! A Christmas tree sits behind them and delightful holiday ornaments seem to hang from the sky. This Christmas card will remind your cousin that it’s time to celebrate this wonderful holiday and have some fun. Send these awesome Christmas characters over to meet your cousin today! This beautiful Christmas card is perfect for newlyweds or even a couple that’s been together for a while, but are still deeply in love! 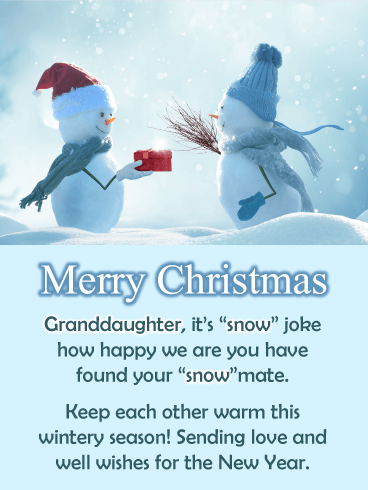 Your beloved granddaughter and grandson-in-law will love this adorable snowman themed card complete with a few “snow” puns to make them laugh! Send love and light this holiday season with the Snow Couple Merry Christmas Card! Perfect for the great grandma who is still young at heart, this card recalls snow days filled with making a snowman and drinking hot cocoa. The beaming smile on this snowman will be matched only by the one on your great grandma’s face when she receives this treasured card. 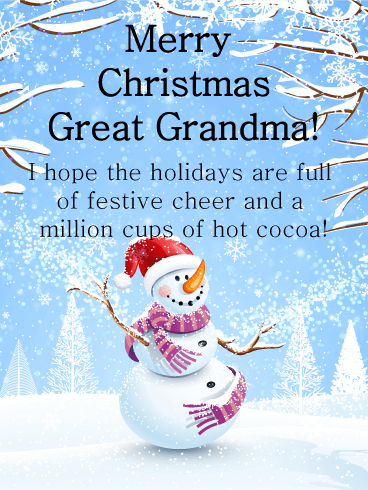 Show your Great Grandma how much she means to you and wish her great fun this holiday season this year with this card! 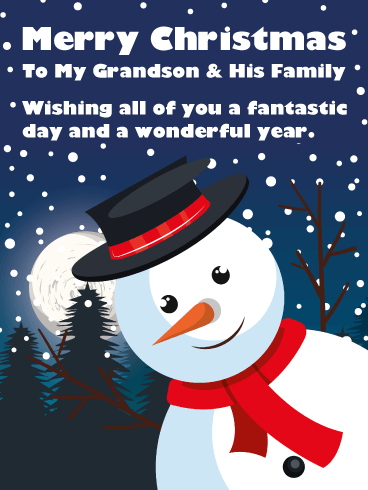 Everyone loves snowmen, especially during the holidays, and that’s why your grandson and his family will really enjoy receiving this Christmas card! This joyful snowman is sporting a top hat and red scarf. Snow is seen falling all around him, which makes for a lovely Christmas winter scene. 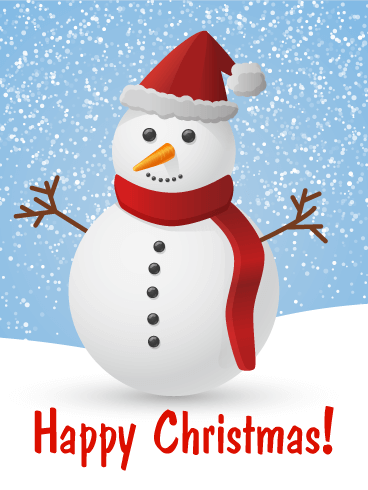 Send this snowman on his way to meet your grandson and his family on Christmas day! I think we can all agree that when it comes to our favorite couples there's SNOW contest: it's grandpa & grandma! This cheerful, snow couple are wearing matching red scarves, fancy hats, and holding broom... so you might mistake them for your actual grandparents! Just kidding, but they do look cool! 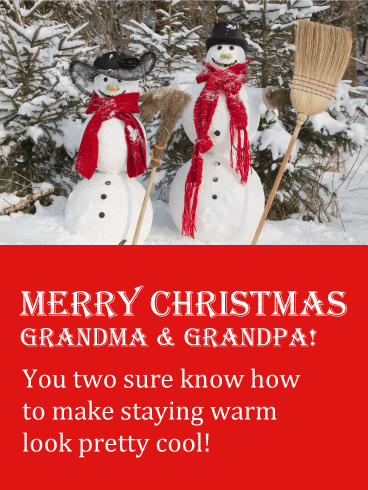 Send this fun card to brighten up your grandparents Christmas season! Everyone is busy shopping and entertaining during the holiday season, but it's important to make the time to send out your Christmas thank you cards. 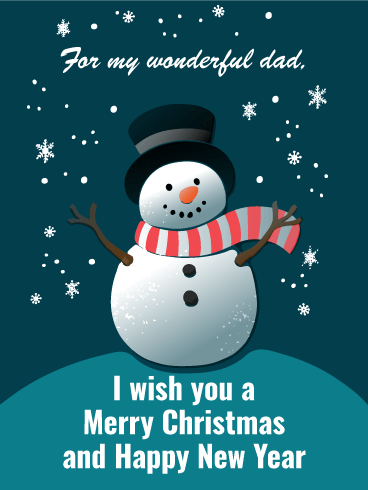 This adorable snowman Christmas card will warm the hearts of those you send it to! This delightful snowman will wish someone a Merry Christmas as well as give them a big thank you! 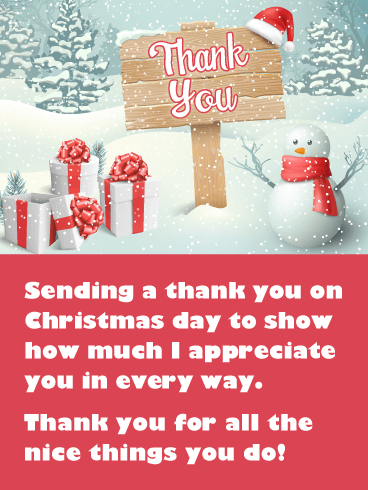 So make the time to send this cheerful Christmas thank you card out today! A thank you can mean so much, especially during the holidays. This festive greeting card will allow you to send a Christmas thank you over to the person you are thankful for. It expresses that you appreciate the nice things they do. 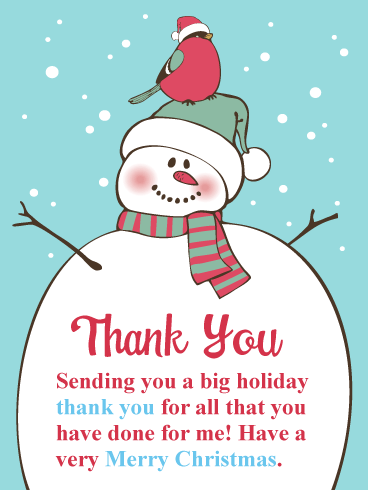 This Christmas card features a winter wonderland with a lovely snowman, perfectly wrapped presents, and a thank you sign topped off with a fun Santa hat. This Christmas card is fun and thoughtful and will be enjoyed by anyone who receives it! Your sister has been with you for half the Christmases of your life. You've looked out the window for the first star, wrapped scarves around snowmen, rolled out cookie dough and folded the good napkins. 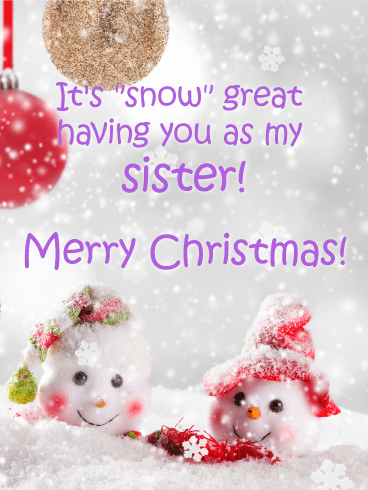 While the snow is falling and it's cold outside, send your lovely sister this reminder of those warm moments and wish her a Merry Christmas. If your parents are the winter blanket around your shoulders, your brother is the mug of hot tea nestled between your hands. Small, comforting, and warming you inside and out, there is no one like your brother. Let him know how important he is to you by sending him this wintery Christmas card. He's a special part of your life. Break out of your bubble this year and send a Christmas wish to everyone you know! While the year might have been hectic, keeping us away from those constantly on our mind, take the time to reach out to them now. 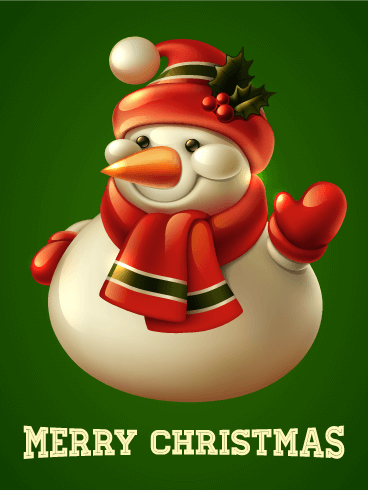 Wish everyone a bit of happiness this Christmas, and there's no better way to do that than with a smiling snowman! As the weather gets colder, we turn to inside comforts to keep warm. Fireplaces and tea, blankets and sweaters. But nothing is warmer than the knowledge of being loved and cared for. Send a Christmas wish guaranteed to warm every heart this year. Friends, family, and co-workers all could use a Christmas wish to curl around. 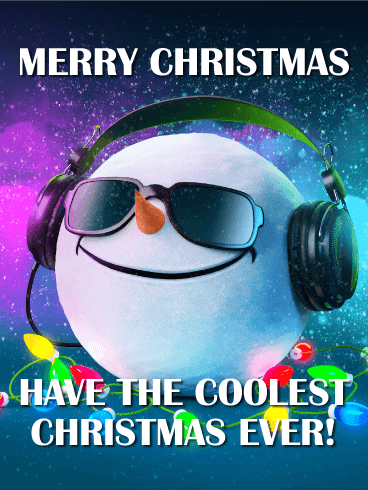 This cool snowman is rocking out for the holidays, complete with his headphones, shades and colorful lights all around. It's a totally card for wishing somebody a totally awesome Christmas! As adults, we still hold a special place in our hearts for all those wonderful Christmas icons we grew up with as a child. These are the things that make Christmas so magical! This Happy Christmas card features the most famous figures of the holiday season, Santa Clause and his reindeer, and of course, an adorable snowman! 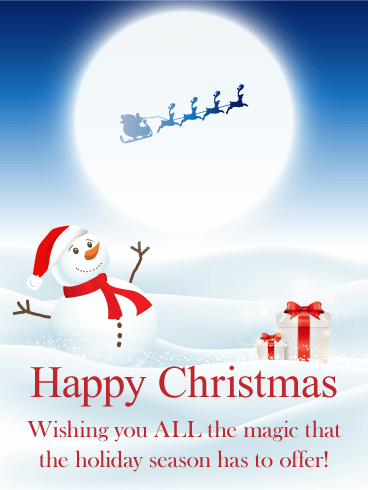 Send this endearing card out today to make sure someone you care for has a Happy Christmas day! The holiday season is all about spending time with the people you love. Cozy chats by the fire, exchanging specially chosen gifts, and days spent building snowmen in the winter air. 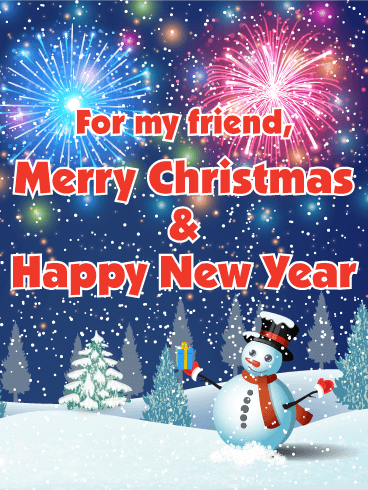 To help your friend have the best Christmas and New Year's celebration, send this Christmas card to share your Merry Christmas wishes. Then you can spread Christmas cheer to everyone that you hold dear! The holiday season is always a time for fun and celebration with the people who are closest to us. 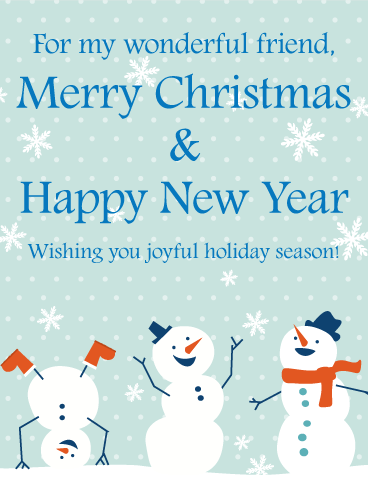 As Christmas and New Year's approach, use this Christmas card to send your warmest holiday wishes to your friends! The bright fireworks and silly snowman will show how excited you are to celebrate the holidays and have an amazing time with them together! Jolly and plump! 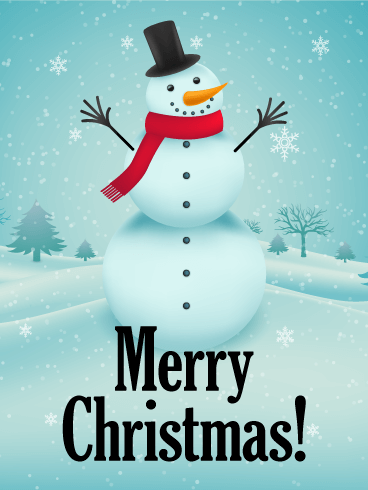 Send the cutest snowman around to wish someone a very merry Christmas this holiday season! This snowman is staying warm in his mittens and scarf, but what's that? Some mistletoe in his hat? Give him a quick kiss and make his day, or better yet! Send this Christmas card to your loved ones and flood their inbox with holiday cheer and good tidings! Let Frosty do the talking for you this Christmas! A snowman is a classic and welcome Christmas sight! This adorable fellow is dressed to the nines in a holiday top hat, scarf, and buttons. 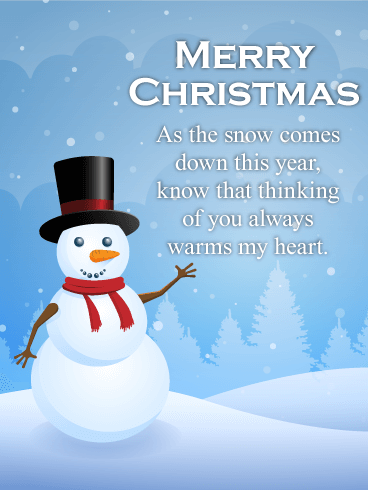 Let his warm smile brighten up someone's day when you send this holiday card to wish a merry Christmas. He looks so dashing surrounded by twinkling Christmas lights, candy canes, and gently falling snow! If you were lucky enough to grow up in a place that got decent snow, you're probably an old hand at building snowmen. Or snowladies - we don't discriminate. Even if you grew up somewhere where it rarely snowed and your efforts at building snow people were not very successful, you can still appreciate a good snowperson. Luckily for you, there's one on this Christmas card! Do you like to build snowmen during the holiday season? 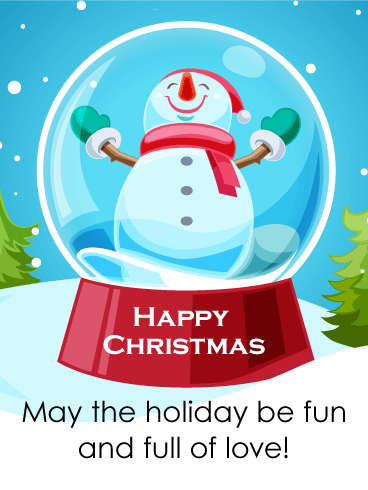 The Santa snowman on this Christmas card is ready to celebrate the holidays with your friends and family! This smiling snowman has a Santa hat, red scarf, carrot nose, two branch arms, and coal for his eyes, mouth, and buttons. He sits in a gentle snowfall above the "Happy Christmas!" message, ready to spread Christmas cheer! This snowman says "Let it snow!" There's no greater fun than sledding or building a snowman on a chilly winter day. This holiday is filled with fun and goodwill, so why not share it with your friends and family? A Christmas greeting as friendly as this one will lift anyone's spirits. You don't need to find a carrot or a top-hat to send this Christmas card! The snowman is all smiles and ready to wish someone a very Merry Christmas today! What is the best way to say Merry Christmas? With this Happy Santa & Snowman Christmas ornaments card! 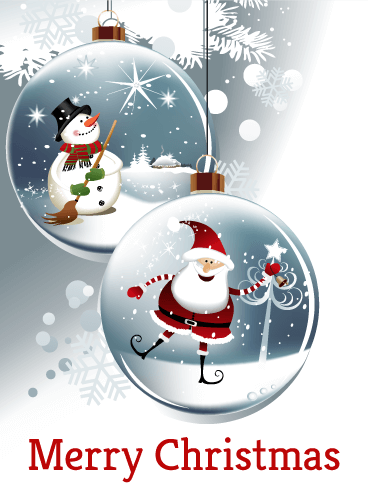 The fun-filled, snow globe ornaments are displayed on a gray and white background that features large and small white snowflakes. Santa happily rings a bell in front of a Christmas tree, while the Snowman sweeps the snow under a star-filled sky. Send your Christmas greetings with this cheery, adorable card! 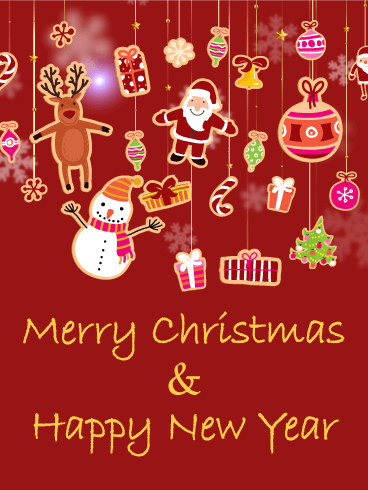 Use this cute Christmas card to say "Merry Christmas & Happy New Year" to your friends and family. Brightly colored Christmas cookies cover the front of this red, snowflake-filled card. Let a jolly Santa Clause, adorable Rudolph, and frosty snowman, joined by presents, ornaments, bells, and candy canes, spread Christmas cheer and Happy New Year wishes through this fun-filled holiday card!